Thermogenesis is the body's natural process for burning off excess fat through the generation of heat. Studies have shown that certain herbal blends can synergistically assist this thermogenic response. Thermo Slim Tea is a delicious low calorie beverage that combines the well-known benefits of Green Tea (provides bioflavonoids and polyphenols) with White Willow Bark, Guarana, Ginseng (Panax), Eleuthero Root, Ginger, Licorice, and Damiana. These herbs receive a catalytic boost from Cayenne to help accelerate the metabolic process and support the whole concept of "fat burning" by converting calories to heat. 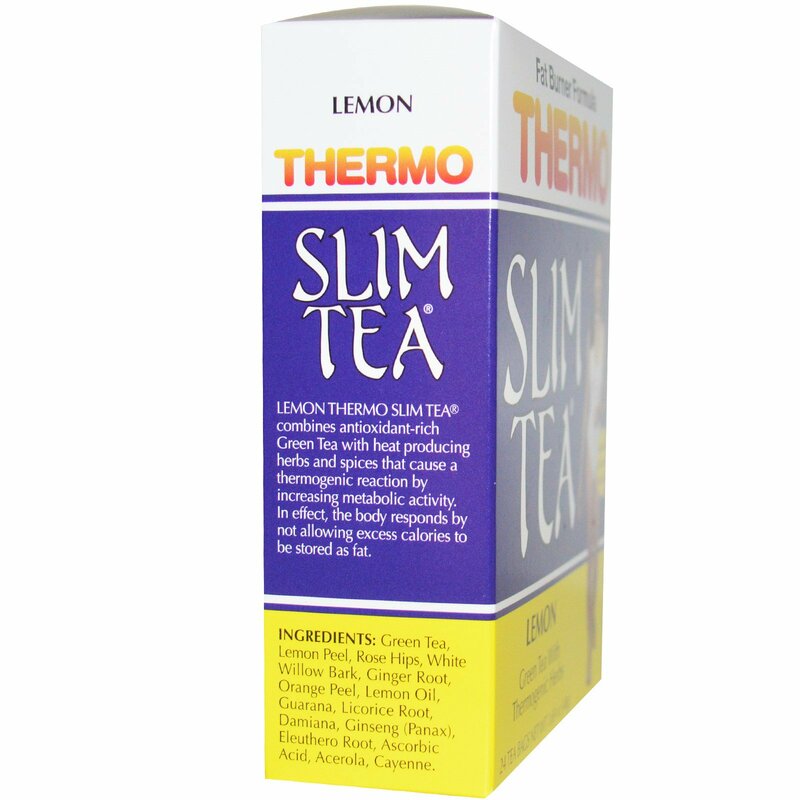 Thermo Slim Tea's balanced tea, herbs and spices formula is further strengthened by the addition of Citrus Peel, Ascorbic Acid, Rose Hips and Acerola for extra antioxidant and Vitamin C value. 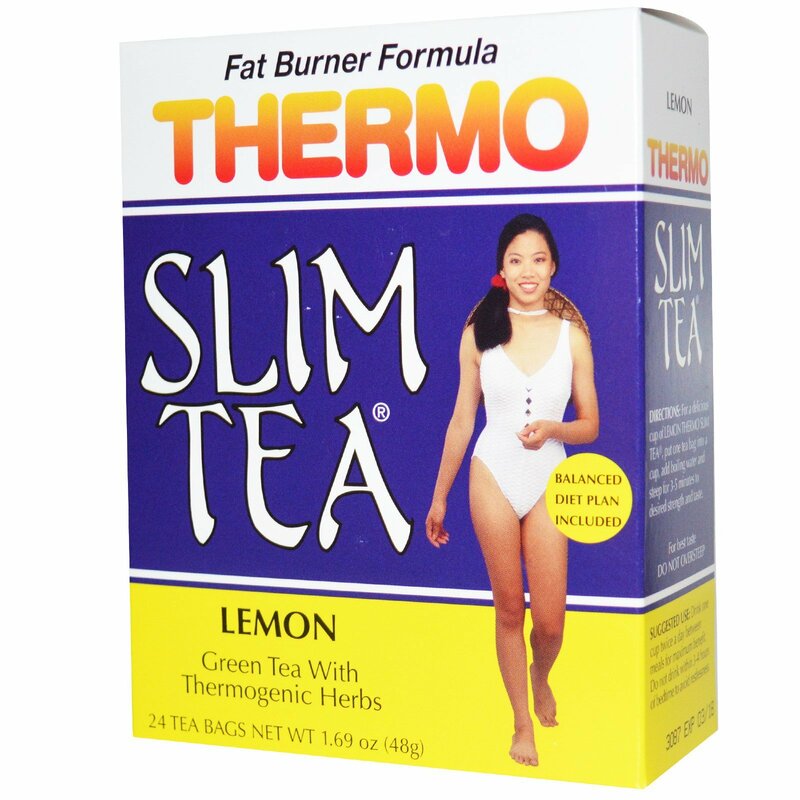 As with any effective weight loss program, Thermo Slim Tea works best when combined with healthy eating habits and a consistent exercise program. See the enclosed Balanced Diet Plan for nutritious meal planning tips. Energize yourself! Combine a nutritious diet, regular exercise and Thermo Slim Tea to achieve better health and fitness! For a delicious cup of Lemon Thermo Slim Tea, put one tea bag into a cup, add boiling water and steep for 3-5 minutes to desired strength and taste. For best taste do not over steep. Drink one cup twice a day between meals for maximum benefit. Do not drink within 3-4 hours of bedtime to avoid restlessness. Green tea, lemon peel, rose hips, white willow bark, ginger root, orange peel, lemon oil, guarana, licorice root, damiana, ginseng (panax), eleuthero root, ascorbic acid, acerola, cayenne. Caution: Seek advice from a health care practitioner prior to use if you are pregnant, or nursing, or if you have high blood pressure, heart or thyroid disease, diabetes, difficulty in urination due to prostate enlargement, or if taking an MAO inhibitor or any other prescription drug. Reduce or discontinue use if nervousness, tremor, sleeplessness, loss of appetite or nausea occur. Not for children under 18. Keep out of reach of children.